Price varies between $130 & $150 online. Bear in mind that like most of these “shanzhai-esque” products, what’s advertised on the web page may be different to what you get. There are a few similar-looking products out there – I’ve seen ones with SoCs from Rockchip and Amlogic. Also, specs and build quality can vary widely depending on vendor. The hardware is cheap & cheerful. The marks and scratches visible in the photos weren’t me, it was like that out of the box. EDIT June 2012: Tony points out in the comments that there’s a thin film covering the piano finish, and he’s absolutely right. Here’s a quick photo, the top-left corner is a reflection. Nevertheless, things mostly work and the build quality seems OK. One thing I did notice is that the video output can be a bit picky on the stock firmware – only some of my monitors worked, and I saw reports of some TVs not working. I think the requirement may possibly be supporting a 720p YPbPr video mode. The other cheap and nasty bit is the little plastic “door” on the front covering 2 USB ports. It’s hard to open and close, and I doubt any serious user would leave it there for long. If you’ve never heard of “Android TV”, that’s because it doesn’t really exist. There is a thing called “Google TV”, but those products are relatively rare and closed-source and not available for $130. Sound nearly unusable? It is. A touchscreen interface is not a PC, which is in turn not a remote control interface. It’s horrid. The device works pretty well with a wireless keyboard and/or mouse. Which is fine, but you’d be just as well off buying a tablet with an HDMI port (for less money) or even just hooking up an old PC. I didn’t use Android much – I can confirm the browser works quite nicely. However, looking around the internet I saw a lot of reports of patchy video playback. Which is disappointing. So why did you buy two? I bought these because I have a weakness for cheap low-power ARM hardware. I wanted to see how easy it was to port GNU/Linux, and maybe have a stab at porting XBMC. I’ll put details about running GNU/Linux in a follow-up blog post. Here’s the board. The sloppily attached cable is the serial console. Thanks to eDIY NZ for posting the serial cable pinout online – it’s a 3.3v lvTTL port, 115200bps. Looking top-to-bottom in this photo the pinout is 3.3v/TX/RX/GND. The hot glue was originally for strain relief! For a serial link, I used my favourite source – a mobile phone USB<->Serial cable that I got for $2 at an op shop1. Also note the unpopulated USB port, some unpopulated front & rear connectors, and the button cell battery. The battery surprised me, I wonder why they didn’t drop it to save on BoM (bill-of-materials) cost. The large clear LEDs at the front are the IR LED beacon for the “wiimote-style” remote. The red LED is for power (amusingly, HDMI standby power can come from the monitor and light it even when the unit is off!) The green LED is connected to a GPIO. Pry off the RF shielding and things are a bit more interesting. “Open in New Tab” on the images if you want to be able to read chip names. * Sandisk flash memory. I believe this is an “embedded MMC” interface – it shows up as an SD card to the kernel. * TI WL1271 combined Wifi & Bluetooth adapter, packaged by Samsung as the SWB-T37 and connected via SDIO. On the underside, the most interesting thing is the Nordic Semiconductor nRF24LE1 2.4Ghz digital transceiver under the left-hand shield. This is connected via SPI and talks to a similar model IC in the remote control. I haven’t looked at the protocol yet. Under the main cover, it looks like there is an unpopulated LCD interface. Plus something else totally unpopulated on the bottom left. Given that Mesada also make many GPS devices, maybe there is a car GPS that uses this board? PCB identifier for this batch is 9000J-MSD-SACC-PCB-110107. Which I guess makes it just over one year old! As I’ve written before, GPL compliance for these kinds of products is generally poor. The FV-1 is no exception, as far as I know it is impossible to get source for the exact Linux kernel running on the device. It is possible that distributors outside China, like Kogan here in Australia or “Flexiview NZ”, are able to supply GPL source code – they have more reasons to act ethically and not break the license, and potentially severe consequences if they are distributing a violating product. I don’t have any more information either way. In the meantime, I bought this device anyhow because Samsung are generally proactive with open source development, and S5PV210 SoC support is part of the mainline Linux kernel. In practice, it was much more work than I anticipated to get a kernel building from source that runs on the device. The device comes with a 2.6.32 Android kernel loaded. Here’s a dump of the boot messages and dmesg, plus some interactions from the Android side – /proc entries, mount points, etc. * In-kernel driver (it seems) for the RF remote, via SPI. Also of note is that Android isn’t using a Framebuffer device for the HDMI output (the framebuffer in that kernel is for the LCD only.) 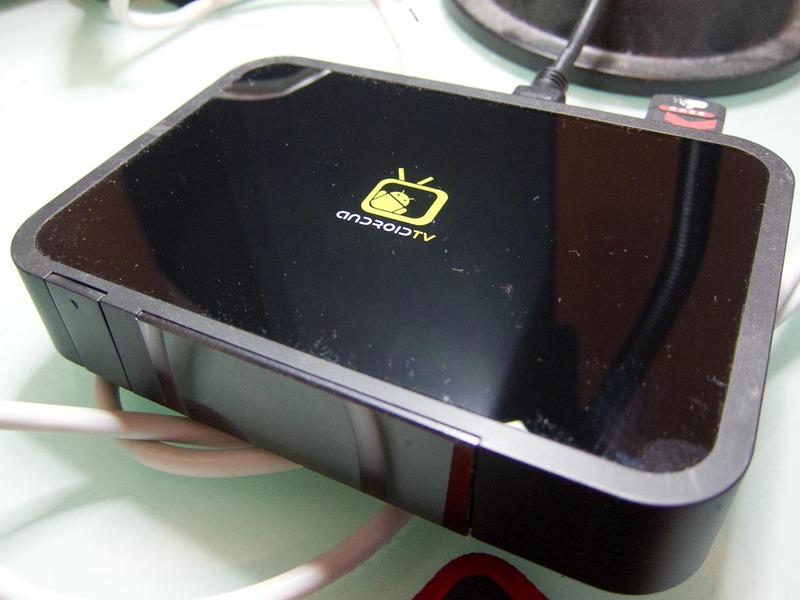 Android must be using an earlier revision of the v4l2-based s5p-tv interface. As I said, it seems like no source exists for the 2.6.32 “vendorkernel” that ships on the device. I now have a 3.2rc kernel that boots and can run a normal GNU/Linux, with xorg over framebuffer, available here on github. Not everything works yet, though. Some of the fixes are a bit hacky and need to be cleaned up. Hopefully, soon some of the support can go upstream to the mainline kernel. More on this kernel in a follow-up post. The Samsung Galaxy GT-I9000 source code, available from opensource.samsung.com, is for very similar hardware. 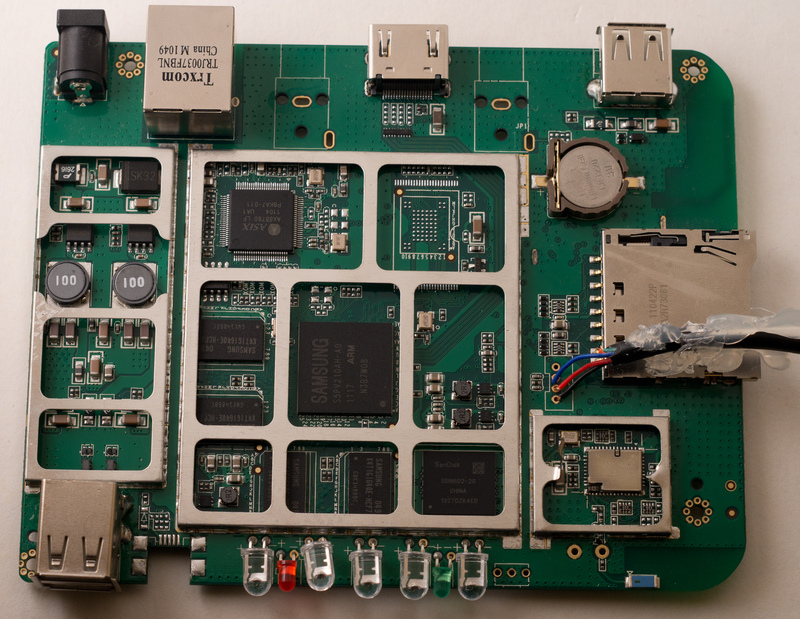 A Chinese development board called the RealARM Realv210. 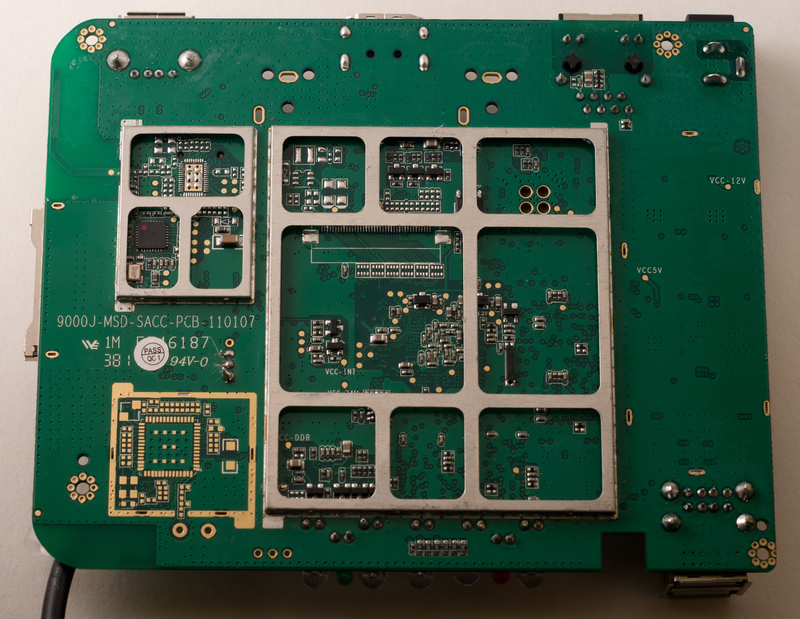 This looks to be very similar to Samsung’s SMDKV210 development board. I think the FV-1’s reference board was either the Realv210 or the SMDKV210. RealARM are distributing a number of useful resources, including a Linux 2.6.32 kernel for the Realv210 board. This reference has been very helpful in getting 3.2 up and running. The last vendor surprise is the bootloader. “Mesada mboot” is the strangest embedded bootloader I’ve ever seen – among its features it appears to be able to both read and format EXT3 filesystems! Unfortunately, mboot is also closed source and no documentation is available. The good news is I’ve managed to reverse engineer enough of the format to “unpack” and “repack” mesada’s .osk firmware update files. This allows the flashing of a new kernel, or new system partitions, or even a new bootloader. The project is called mboot-tools and is up on github. There are some usage instructions in the README there, and lots of comments in the header file. I’ll put a post up soon explaining how to boot Debian on the FV-1, explaining what currently works and what doesn’t. 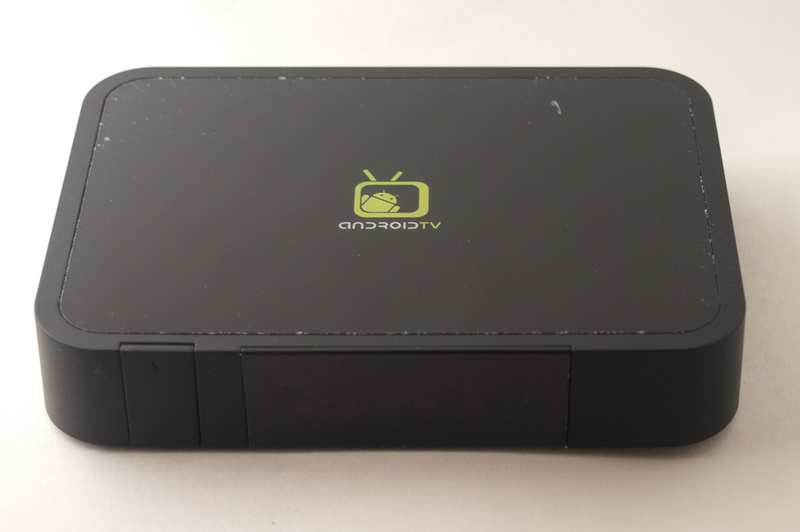 Check the “androidtv-large-5.jpg” photo, seems to be bad uploaded. Thanks Sebas, they all seem to work for me though. You mean the one immediately under “So why did you buy two” ? It’s in spanish, but the video inserted it’s in english. 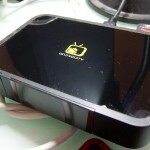 It’s a HDMI-Dongle that can put Android on any TV… but it looks to cheap to be real. Â¿Fake? I think it’s probably real, although the final price point might be a touch higher. Seems this kind of tech is going to get really cheap & plentiful over the next year or two. Hopefully the software can keep up, it might be the “year of Linux on the TV-attached box” ;). So is these boxes in a stable, usable state with a 3.2 kernel? Did you try port xbmc on it as you said? Eric – I hope to post a Debian build and a video in a week or so. Just trying to get the wifi+bluetooth chip to play nice, then I think everything will be supported except 3d acceleration hardware and the remote control. 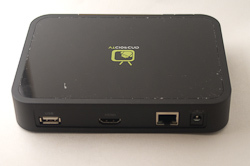 So usable as a “normal” desktop computer, but no good for XBMC without hardware 3d. For your little OMAP board, it shouldn’t be too hard (famous last words.) There is already support for some OMAP3430 boards under arch/arm/mach-omap2 (ie board-3430sdp.c). Look at the kernel config that came with your board, and see what board is selected there – you may need to port the “board file” from your 2.6 tree to the 3.2 tree, and then clean up anything else so it builds & runs… Can be pretty fiddly but it shouldn’t be too hard given you already have working source. Do you have any advice/hint/steps for the porting? ” like I use for other ARM systems but no luck. What compiler are you using? This is my first 3.x build, my other embedded work is locked into 2.6.30. You looking for any help on the wifi driver? I looks for info on the chip mentioned and TI had some info. They seem to have two different drivers for it that work on the OMAP. I think one is an SDIO driver and one is MMC. Thanks for getting in touch! You should be fine with any toolchain that works on 2.6.30, FWIW I’m using emdebian. I do “make ARCH=arm CROSS_COMPILE=arm-none-linux-gnueabi-” but I’m guessing that might be just a typo. I’ve uploaded the Debian config I’m currently using to http://projectgus.com/files/fv1/config-flexiview-nfs if that’s of any use. It’s configured for NFS rootfs, so you’ll need to edit the default kernel command line if you want to boot from MMC or USB. And also probably remove the DHCP client option from the kernel. Hopefully I’ll get proper Debian images and a howto up soon, have been consistently stuck on the wireless option for weeks now – going around in circles. Using the wl27xx driver in the kernel tree, I get random fatal sdio errors at random times – even with the mmc host rate turned all the way down. I don’t know if it’s the wl27xx driver, or something in Samsung’s mainline mmc host drivers. I’m going to try the alternative wl27xx driver, the “TIWLAN” one provided by TI. That’s what the stock Android firmware is using. I haven’t gotten it to build yet, though. Will keep you posted. in case thats helpful to you, I’ve never had one build as a modules but not into the kernel, maybe its important? I tried to get the emdebian package and it switched it to ‘multistrap’ automatically, how helpful. The help page I found implied thats the ‘new way’ but reading through the howtos it seems like they are different. So you are building with emdebian? I think I’ll just manually install the package if so because this multistrap seems like a step down for cross compiling. Good to hear you’re making progress! For the KALLSYMS_EXTRA_PASS thing, have you tried ‘make clean’? That’ll often solve it, either that or it’s some bug with the dependencies for the wl12xx modules I think. The extra pass thing fixed the build, I’m not sure if built in vs modules will make any difference but I figure once its working that would be the ideal built since the hardware doesn’t change. Yeah, I wasn’t sure how to get a good rootfs. I looked at the debian arm stuff but it all seemed focused on a USB drive install. I thought that was what you meant you were using emdebian for, to build a rootfs but I checked out debootstrap and I get it now. I went and built a buildroot rootfs for Cortex A8 since I know how to do that, but I’ll try debootstrap as I’d much rather have debian then get stuck with uclibc. Sounds good. I also mean to clean my Debian wheezy rootfs up and post it here some time soon (! ), if you don’t feel like DIYing all the fiddly bits. on the upgrade page, they are two “.osk” files. Which one should we be using for the upgrade and since you mentioned I got confused about one aspect. I think there are some newer ones out there now like this one from November. If you’re going to upgrade from inside the FV-1, copy a single .osk file and follow the procedure here. Hola, es mmi interes recuperar mi android flexiview fv-1, ya que no inicia , aparece la pantalla andrioid, y a los 6 segundos se reinicia constantemente, el mando no responde de ninguna manera, hay forma de resetear con teclado, Gracias por su informacion. running this at moment but got someone looking into it for modding. angus .>> i am on this site to where you got the osk from. newer operating system can be intresting to. Has somebody the cifs.ko for the Kernel? >>> The marks and scratches visible in the photos weren’t me, it was like that out of the box. This is just a protective plastic film that is intended to be removed. Once removed you will see a very nice piano black glossy panel that looks very nice. Ha, thanks Tony! I can’t believe I didn’t notice that. I’ll update the post. your site help me since my problem on wm8505 android tablet until now, which i currently building linux system on tiny210-sdk. it’s great to find you. >>> Has somebody the cifs.ko for the Kernel? Utterly composed written content , thanks for selective information ….